An expanding car wash company will take over a vacant car wash property. Photos by Burl Rolett. A growing car wash concept is cleaning up a corner of Santa Fe. Centennial-based Car Wash Express is renovating a building at Sixth Avenue and Santa Fe Drive with plans to open its sixth Colorado location. It’s the first Car Wash Express near the city center, and Express President Brett Meinberg said the company is looking for more. “There are a bunch of full-service washes but nothing for the time-starved people,” Meinberg said. The new location will replace a former Denver Car Wash at 603 Santa Fe Drive. Car Wash Express, acting as Somerset Land Company VI LLC, bought the half-acre site last fall for $1.3 million. 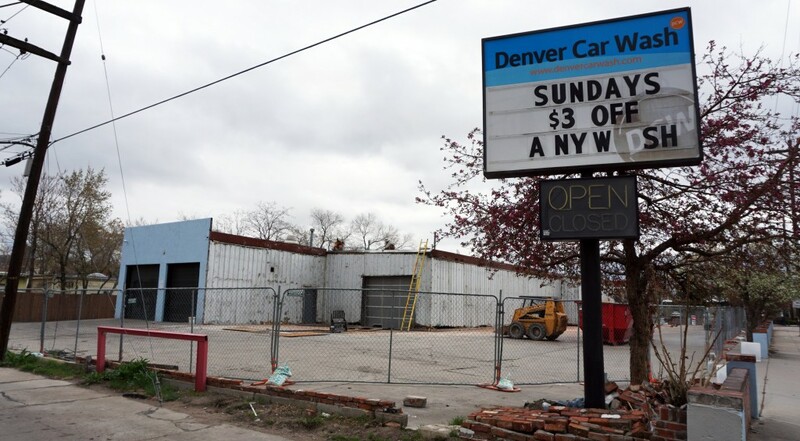 By then, the Denver Car Wash had been closed for about six months, Meinberg said. Car Wash Express launched in 2002 and has locations in Highlands Ranch, Centennial, Broomfield, Aurora and Northglenn. The company offers 3-minute car washes for $7 as well as an unlimited wash pass for $30 per month. Meinberg said Express has slowly added locations around Denver and in Grand Junction over the last 12 years, but now the company is looking to expand more quickly. He didn’t put a number on how many car washes he would like to open, but he said he sees a need for more quick-service, drive-thru concepts in crowded urban areas like downtown Denver. Meinberg could not say precisely how much it would cost to open the new location but said the project would run a couple million dollars. The Santa Fe location is slated for an August opening. Loveland-based Coe Construction is the general contractor. For its first Denver location, Meinberg said Express Car Wash is taking a little extra care to try and blend in with its neighbors along Santa Fe. For example, he’s looking to hire a local artist to put a mural on the wall – a touch spared at Express’ handful of suburban locations.